Trombone Shorty. The New Orleans bandleader born Troy Andrews headlines his Voodoo Threauxdown tour at the Great Plaza at Penn's Landing on Sunday. Trombone Shorty is a misleading name, if not a misnomer. Troy Andrews stands a hair under 6 feet tall, and the New Orleans bandleader and singer who brings his Voodoo Threauxdown tour to the Borgata in Atlantic City on Friday, Aug. 10, and to the Great Plaza on Penn's Landing on Sunday, Aug. 12, also plays trumpet, tuba, organ, guitar, and drums. Andrews, a native of the Crescent City's fabled Treme neighborhood, is the grandson of the late Jesse Hill, beloved for the 1960 Big Easy standard "Ooh Poo Pah Doo," and the 32-year-old's stature as a New Orleans music ambassador has risen to the point that he now closes out the city's Jazz & Heritage Festival every year. Shorty's seventh studio album, Parking Lot Symphony, came out on Blue Note Records in 2017, and he spoke on the phone last week while sitting in a parking lot outside his tour bus before a show in Hampton, Va. The Threauxdown lineup is formidable. In addition to Shorty and his band Orleans Avenue, which will feature Cyril Neville as a guest, it includes funk outfit Galactic, bluesman Walter "Wolfman" Washington, the forward-thinking traditionalist Preservation Hall Jazz Band, and modern-day Satchmo Kermit Ruffins. Shorty promises that "when we get on stage, people will think they're partying at a Mardi Gras ball." Trombone Shorty. The New Orleans bandleader born Troy Andrews headlines his Voodoo Threauxdown tour at the Great Plaza at Penn’s Landing on Sunday. 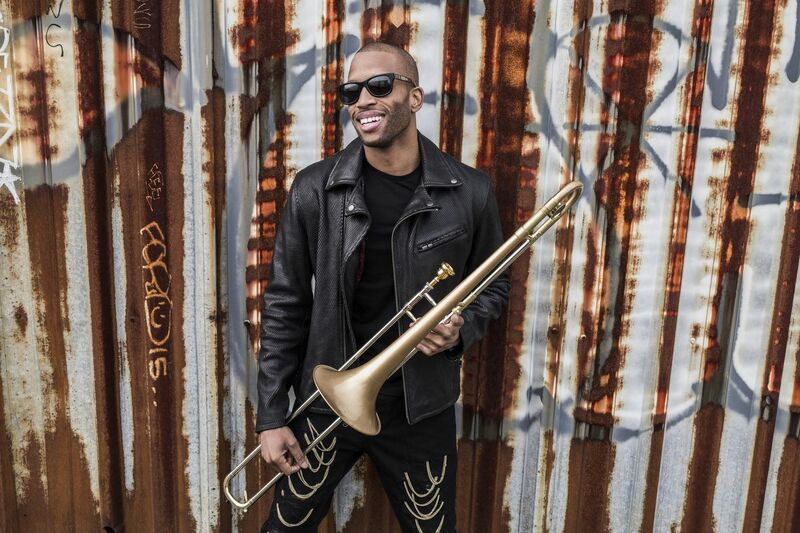 Who first called you Trombone Shorty? When I was about 4 years old, my brother started calling me that at a jazz funeral. Everybody in New Orleans has a nickname. We got a guy named Tuba Fats, we got a guy named Washboard Chaz. Your brother James is also a musician, and he’s 17 years older. You started young. Did people treat you like a golden child? In New Orleans, there's musical families and I think my brother saw something special in me so he kept me around him as much as he possibly could. He just kept me by his side. I started going to Europe with him every summer when I was 7. You were a bandleader when you were 6. How is that possible? How old were the other people in the band? They were my age. The oldest person in that band was probably 12 years old. That was my cousin Glen David Andrews. He was by far the oldest and the tallest person in the band. But he didn't want to take over the leader position, and the next in line was me. We were fortunate to have the Rebirth Brass Band and the Dirty Dozen Brass Band always by my house, and they would help us out. What was that band called? Trombone Shorty's Brass Band, aka the 5 O'Clock Band. Every day, we would get out of school at 3 p.m., and after we did our homework, we would play in the street. It’s amazing for kids to be pulled into such a powerful local tradition, rather than something you see on TV or hear on the radio or find on the internet. It's very special. We had neighborhood superstars who were more important than anybody we'd see on TV. We didn't hear anything else outside of what they were creating. So there was always music around, and it was so dominant in the neighborhood that if we didn't play music, we would be considered outcasts. You were in Treme, David Simon’s HBO show about New Orleans. You did “Ooh Poo Pah Doo” with your brother James. What did you think of the show? Treme was the most authentic representation of New Orleans on TV. They hired neighborhood people as actors. They got the real stories. And they used them as consultants, too. Even down to the tambourine people. Certain [Mardi Gras Indian] tribes do things a different way. Uptown people play with their fingertips. And downtown in Treme, we play with our knuckles. I watched one or two episodes. I just wondered if people around the world understood what was going on because we have our own language, our own music, our own food. I wondered if people actually understood it. When you talk about neighborhood superstars, I assume you mean people like Kermit and Wolfman Washington. Absolutely. I basically lived at Cyril Neville's house when I was in my teen age. I was over there 90 percent of the time. I learned so much from him. When I was about 12, he took me on the road with the Neville Brothers and that was the biggest thing that I had ever done. For me to be able to repay that back to him is just a beautiful thing. Him, Wolfman Washington, Kermit: I stand on their shoulders. For me to be able to introduce my crowd to them if they don't know them is a big deal for me. Is repping New Orleans around the world an important job? I never thought about it in that sense. I was just doing what I grew up listening to, from the Neville Brothers to Master P and Juvenile. It happened naturally. I grew up under Allen Toussaint and Dr. John, and I was able to get that knowledge from them. But I'm also 32, and the music that's surrounding my ears is very different than what Allen Toussaint was listening to. So I'm influenced by hip-hop and the Red Hot Chili Peppers and people like that. May he rest in peace, Mr. Allen Toussaint, he would always tell me: "Take everything you can take from us. But don't be us. Be yourself." You were about 20 when Katrina hit, right? Yeah, I was 19. I had just graduated from high school and had just gone on the road with Lenny Kravitz right before that whole thing happened. By me traveling my whole life, I understood the importance of New Orleans music. But what it did for the city as a whole … Check this out: There was people that never left the city, but there was also people that never left a 20-block radius in their neighborhood in 30 years! I have a great memory of seeing Kermit lead a jam session in Treme on a Monday about 20 years ago in a tiny club called Little People’s Place. It was an incredible night of music. That was a couple of blocks from my house. Kermit always had free barbecue, and even though I couldn't get in the place, it was so small, I used to look in the back door and listen and then wait till he would take a break and go in and get the free chicken. How did you find your way within the New Orleans musical tradition? I come from the street funk. Brass band music. And when I got to maybe sixth grade, I was introduced to Nine Inch Nails, and the Foo Fighters and Lenny Kravitz. I toured with Lenny for two years, and that really left a hell of an impression on me. How tight it was, how disciplined it was. In New Orleans, we learn a song, and then once we learn it, we play it however we want to play it. For me, to learn that discipline really opened my ears. I put it in with what was going on in my teenage years, listening to a lot of Cash Money records, Lil Wayne. And also things like Ministry, and some of those people I got to work with, like Green Day and U2. Every experience I was in, I took that back with me and put it in my gumbo pot. I decided I wanted to work on a show, and I wanted us to be really tight. I started studying James Brown videos to become a conductor on stage. I approach the stage with a pop sensibility, like Michael Jackson. Do you still live in Treme? No, I live around the lakefront, in the Seventh Ward. Not too far from Treme. I got property in Treme, I'm always there. My grandma is there. I spend about 93 percent of my time on the road now. Every time I go back there, some type of new building, some new business has opened up. I think New Orleans is doing well. When I go into Treme now, it's not the same, but that's part of life. Because Treme is getting gentrified? It's starting to be gentrified and different people are moving in. Sometimes I wonder if us still in Treme have some sort of part to play in that. … I see people on their Segway things, taking a tour, and I'm like 12, 13 year ago, before the storm, nobody was over here. Now we have all these tourists. But I embrace everybody. It's still a beautiful place. It's just really weird for me to go over there and not see hundreds of people outside and dancing the way we used to. Instead of happening every day, it might happen every other Sunday. And when we do those second lines in the Treme, it's like no other place in the city. You can feel the spirit, you can feel the love. You can feel where it came from. That last slot on the final Sunday of Jazz Fest, when the locals come out is yours now. That must make you proud. Yep. I was fortunate enough to inherit the closing spot from the Neville Brothers about four to five years ago. I played with them every year since I was about 12 years old, and one of my dreams was to either join the band full time or create my own band so we could do that same stage. And I forgot about that dream until it happened. They were gracious enough to pass it along to me and hopefully I can hold it down long enough until I pass it along to the next New Orleans person.